Roatan real beach weddings start with powdery soft white sand under your feet, the sparkle of the sun setting on the turquoise waters of the Caribbean Sea, palm trees swaying and the anticipation of the romantic moment for your destination Roatan wedding or vow renewals. 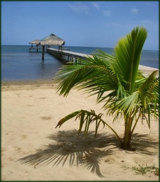 Escape to pristine beaches, coral reefs and participate in Roatan island culture. Isla de la bahia Honduras is here to enjoy. Please help us protect the reef. "Sandy toes and salty kisses."